If you need some more encouragement - you have come to the right page. 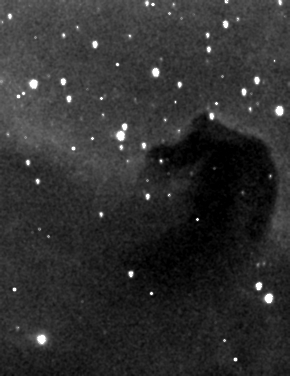 This is one of my earliest photographs taken in 2012 with the Meade LX200R and the Starlight Xpress MX7C camera. It was a fine scope, probably a good camera in its day, but most definitely in the wrong hands! I remember trying to convince my wife that this looked like a Horse Head, but I was having a hard time of it. No matter....I was so proud of my achievement (I actually photographed a nebula that I could not see) - as you should be, regardless of what level you are at. This is not an easy hobby. What can I say.... if you want to make good images, it won't happen overnight. Stick with it and you will improve !